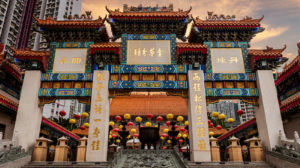 Moving to a city like Hong Kong as an expat can be daunting, and choosing which neighbourhood to settle in is key to enjoying your time here. Mum and housewife Claudine Read hails from Dublin and has lived in Parkview for almost three years. Whether you are moving from overseas or considering a change of scene in Hong Kong, Claudine shares why it may be for you. Where do you live? Hong Kong Parkview. How long have you been there? Nearly three years. What made you choose it? We stayed in their serviced apartments when we first arrived and we were having a hard time finding anything with similar facilities and location – that’s the problem with starting at Parkview: it spoils you! Time was running out, our container and pets were arriving, so our agent suggested staying in Parkview and we’re really glad we did. When you walk out of your place the first thing you see is: If you take a right as you walk out, it will take you to the Tai Tam Waterworks Heritage Trail. If you take a left, it will take you to the Wilson Trail Stage 2, leading to Jardine’s Lookout and Mount Butler. Just across the road are Violet Hill and The Twins. Everyone should try The Twins once. The closest store: We have a ParknShop in Parkview and we find it very good. Three words to describe the neighbourhood: Convenient, safe and friendly. The unofficial uniform of your street is: Sports gear! Whether you’re into hiking, gym or classes, this is definitely a place for fitness. The Parkview gym is fantastic, with up-to-date equipment, including a spin studio. The staff will always offer advice on using the equipment rather than leave you to use it incorrectly. They also like to trial newer exercise classes, such as barre yoga and aerial yoga. I have a back injury so I started to take the yoga class that Anita teaches – it’s very popular, for a reason. They also have a great programme for kids. A lot of people come to Parkview resort specifically for the kids’ lessons. If a celeb moves in next door: I think it’s likely to be a TV personality or a pop star. Parkview does hold the occasional celebrity wedding and it’s always amusing to pick my son up from the school bus to be greeted by banks of photographers and paparazzi! A pop star occasionally uses the gym. When you’re in need of a dose of culture: I’m not sure how many people know about this (even residents), but Parkview has an amazing art gallery. I don’t mean artists that no one has heard of; it’s a serious collection: Renoir, Monet, Picasso, Cezanne to name a few. It’s quite an eclectic collection, too, from ancient Buddhas and artefacts from the Chinese dynasties to Thomas Jefferson’s wine collection, Michael Schumacher’s snooker cue and Lego sculptures. Then there are the pieces by Chen Wen Ling, Warhol, Roy Lichtenstein and Dali. My son loves the real props from the Harry Potter and Iron Man films. I happened to have family staying and we bumped into the art curator and he very kindly showed us around. We’ve queued for hours in Europe to catch a glimpse of these artists’ work and it’s all here, right in front of you! If you’re missing home you: I normally go for a walk; it’s so pretty here that it lifts your mood. Or if I need retail therapy I might jump on the bus and head down to Central and go into Zara, Topshop and Starbucks. You could pretty much be anywhere in world and find one of those. A mandatory stop for taking out of town guests: If you really want to have a memorable day, I’d take them on the Parkview art tour, and then, if the weather’s nice, walk the Tai Tam Waterworks Heritage Trail; you’ll find beautiful scenery that people always say shows a different side to Hong Kong. A quick 10-minute taxi ride at the end will take you into Stanley for the afternoon. If the weather’s bad, Teahouse at Parkview does an excellent weekend brunch, or if the pool’s still open the barbecue is always good and it’s not hugely expensive. A common myth about your neighbourhood is: That it’s too far out of the way and it’s a bit “Truman Show”. When we moved here we viewed some of the places nearer to Central, Sai Kung and Stanley and so on; but the village we come from in England is very quiet and green, and Parkview’s setting reminded us of home more than any of the other places. We’re surrounded by greenery here and it only takes about 20 minutes using the shuttle bus to get into Central – and it runs seven days a week, all year long. As for the Truman Show comparison, it’s actually got a community feel to it here; the kids all know one another and all the staff, so they’re very safe, with lots to do. Anyone who lives here seems happy enough; I suppose it’s like living at a resort – but I don’t have a problem with that! If you’re ever woken up at night it’s due to: A storm. We face onto Violet Hill and sometimes there are some very exciting thunder and lightning storms. There’s also a cockatoo that makes a racket, but he’s more of a dawn riser! Favourite activity nearby: Hiking, of course! You won’t find better local food than at: Ming Yuen, one of the Parkview restaurants. I haven’t been for a while as you have to book on weekends. The strangest thing you’ve ever seen: Some of the outdoor artwork can be quite interesting! One thing you’d never change: The staff here; I’ve never had a reason to moan about them in three years. But one thing you wouldn’t mind seeing go: The air-conditioning; it’s always freezing.Also, can I ask for one thing I wish they’d add? A cocktail/sports bar! What would you say to someone considering moving to Parkview? If you have kids or pets, love the outdoor life and are after a convenient place to live, Parkview is definitely worth considering. There’s everything here that kids could wish for: playgrounds, three pools, tennis courts, playrooms, football/ basketball courts, a preschool, skate park, restaurants – the list goes on. It’s a great base for adults, with easy accessibility to the trails, but also it’s not that far away from Central. Stanley and Repulse Bay are also within easy reach. It’s not too far from anywhere, but just far enough!